JEE Mains 2017 exam conducted today in different centers across India. The difficulty of JEE Mains 2017 examination was moderate. It was not an easy exam because adoption of different pattern in comparison to the earlier years. The past four year cut off marks for JEE Mains exams are given in the below chart which are substantially important to ascertain the actual expected JEE Mains 2017 Cut off. Around 12 Lakhs students from all categories appeared in the Joint Entrance Examination. Out of which around 2,20,000 students will be selected for JEE Advance 2017. The number of selection is low in comparison to all students applying for the exam. From 2,20,000 students, around 20% will get direct admission in colleges based on ranks in JEE Mains 2017 Cut off. For General Category: General Category students are expected not to suffer as much as in earlier times. The cut off marks for General Category students floated above 100 during the past years. A small drop is expected this year because there were too many candidates appearing from reserved categories as well during the last year. The data indicated that OBC and General students got the high chance of clearing JEE Advance 2017. However, for Jee Mains 2017 examinations, there will be small suffering by the general students. In this data, General students also includes the reserved category applicants who are not using reservation to get admission. 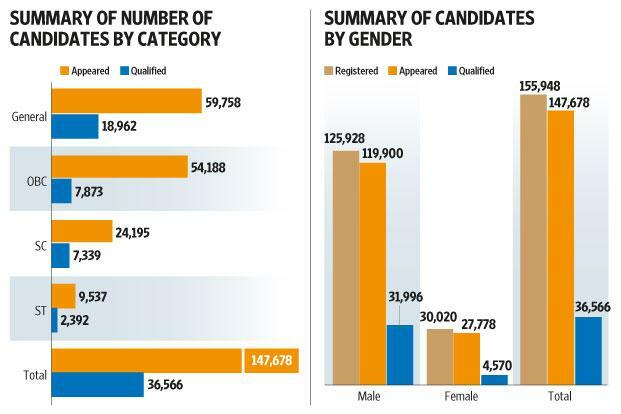 Out of 147,678 applicants in the next level of examination, 41% belongs to unreserved categories. Female students have less but improving passing rate in the examinations. Going through the trends in past of overall candidates appeared in exam. It appears General Category students are going to have cut off marks of 98-102 this year. OBC-NCL Students: OBC-NCL is yet one of the biggest category appearing in Joint Entrance Examinations. We have seen the marks floating between 70-74 over the past years and this year no big change is expected. According to student’s, paper of 2017 was as tough as of past years. With comparatively high chances of selection in universities, OBC-NCL students expected to have cut off of 70 marks this year as well. SC/ ST Students: The students of reserved categories got big benefit in the Mains exams, Joint Entrance Examination Mains 2017 Cut off usually remains almost have of the students having no reservation. This year body is expected to maintain the relief of 50% in cut-off marks for Scheduled caste and Scheduled Tribe students. These figures doesn’t guarantee anything and anything could happen during the actual results. According to information JEE Main 2017 Result for Paper 1 will be declared on 27th April 2017. Previous articleJio Summer Surprise Offer 2017: What Is It and How To Get New Reliance Jio Prime Extended Deal? Next articleHuawei P11 Release Date, Specs, Price: To Launch At MWC 2018?